#MoviesMusicPlaysFilmFestivalsConcerts: Film Review: "EL CLUB"
First this disclosure: I am a catholic and I know when my faith is being attacked, I get mad but I was taught to be more understanding and forgiving. I had to compose myself before writing a quick review in my FB account of Pablo Larrain's Berlin-winning follow-up to his Oscar-nominated film "No" because I thought "El Club", a movie about priests with criminal pasts, was vicious, vile and offensive and I was so ready to rip it apart but I realized that it was the exact reaction the filmmaker was aiming for when he made this film and I have to respect that because in all objectivity his film is a powerful indictment and an eye-opening expose of the apparent hypocrisy of the catholic church. With that said, I decided to expand my review and give it a full one after I have given it much more thought. This film is blatantly sacrilegious and it is obvious from the first moment you see the main characters train a racing dog and later engage in gambling which is forbidden by the church, specially among clergymen. 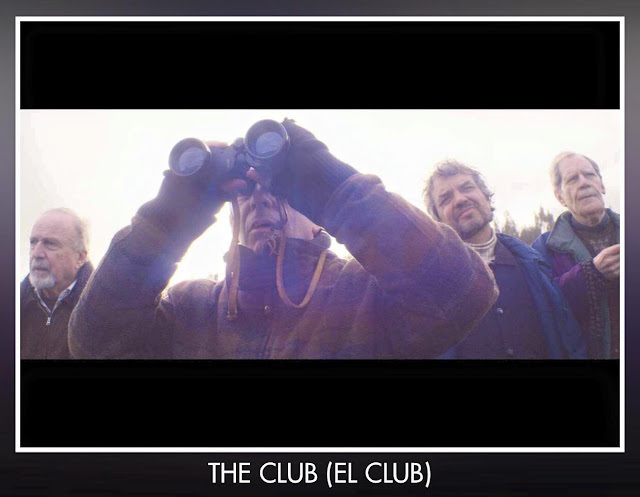 "El Club" tells the story of a group of defrocked priests exiled in a secluded villa in a remote seaside town as punishment and penance for the various sins and offenses they have committed -- their crimes range from kidnapping infants to sexually abusing kids. They all surprisingly live in relative comfort with the town unaware of their presence or their past crimes but all that comes to a standstill one morning when a new priest is brought into town to join them. The priest is accused of the same crimes as the other tenants in the villa ran by a sweet-talking nun who has come to enjoy looking after the priests and the occasional dog racing they engage in. She considers it her "vocation". Soon, a seemingly mentally unstable and disheveled stranger shows up at the gate looking for the new priest and starts exposing in lurid details the abuse he suffered at the hands of this priest. This disturbance will end in a tragedy that was so perfectly staged by the director. May I add here that the cinematography is brilliant! But the tragedy only marks the beginning of what will become an odd investigation of the priests activities, their role in the tragic incident and the threat to permanently close down the villa. How the group resolve this intrusion is where I take strong issue with. The film depicts the group as a gang of criminals who would go to extreme lengths to protect their own, keep their crimes under wraps, while preaching the word of God but to try to condemn the filmmaker's interpretation of the events or to censor and dissuade others from watching this film would be tantamount to endorsing the grossly unchristian acts depicted in the film. I will not do that. Instead, i will give this film the rating it rightfully deserves even if i strongly disagree with its message of hate. I invite you all to watch it and form your own opinion about it.